The possible impact of Brexit on the Falklands is no nearer to gaining definition as UK MPs once again voted against a Brexit deal proposed by Theresa May, as well as voting against the possibility of leaving the European Union (EU) without any sort of deal. 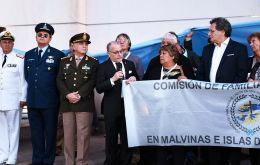 “I imagine you have gone through moments of great emotion in the Islands, next to the graves with the 112 full names, which until now remained unidentified”, Argentine foreign minister Jorge Faurie was quoted in an official release, on receiving the delegation of next of kin, on their return trip from the Falkland Islands, Wednesday evening. 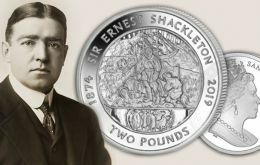 The government of South Georgia and South Sandwich Islands have released a new coin to commemorate the birth of the famous explorer Sir Ernest Shackleton. Born on 15th February 1874, Sir Ernest Shackleton wanted to be an explorer from a very early age, inspired by faraway places that he had read about as a boy. At the age of 16, bored by the school curriculum, he went to work in the Merchant Navy. The Falklands Ultra is a single-stage ultra-marathon across the Falkland Islands in the South Atlantic. It will become an annual event and the inaugural event will be held in April 2020. The Queen has used her Commonwealth Day message to praise how the family of nations inspires its member states to find ways of protecting the planet and its citizens. Millions of people are “drawn together” because of the collective values shared by the institution, the Queen says in her address to the 53 countries of the Commonwealth. By Ander M. de Lecea - Research scientist Drs Ander de Lecea and Marina Costa of SAERI recently completed their first surveys of the Burdwood Bank, kicking off the “Fine Scaling of the Marine Management Areas of the Falkland Islands” (MMA) project. 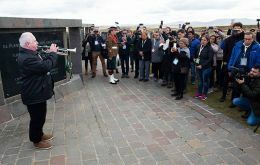 Next Wednesday a group of relatives of Argentine soldiers fallen in the 1982 South Atlantic conflict and whose remains were recently identified will be travelling to the Argentine military cemetery at Darwin in the Falkland Islands. Relatives will be able to mourn and pray next to the gravestones which now have the full name of their loved ones. A military ceremony will also be held to honor the Argentine soldiers buried at Darwin. 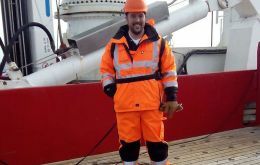 The Falkland Islands Fisheries and Marine Protection, FISHOPS reports that on Friday at 4:00 AM in the morning, the duty officer received a call indicating a man from a Falklands' licensed Taiwanese jigger went overboard. UK-based oil and gas firm Premier Oil with interests in the Falkland Islands has announced its full-year results for 2018, reporting a post-tax profit hike to US$ 133.4m as a result of record production. These full-year results are a ‘return to profitability’ from 2017’s full-year loss of US$ 253.8m.